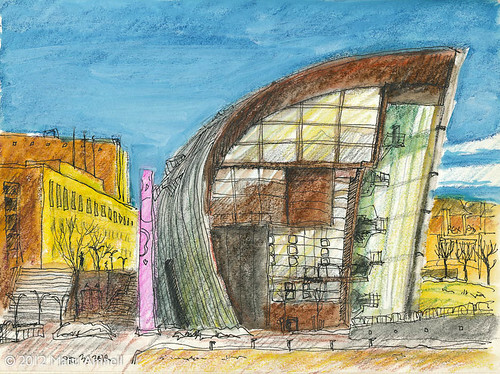 This entry was posted in Sketch of the day, Sketchbook and tagged architecture, city, finland, helsinki, ink, museum, pencil, watercolour. Bookmark the permalink. I really like this building – though the exhibitions are rarely much good and though the Sanoma building (which itself is also far too big) is far too close to it. But you make Kiasma look particularly good. Looking forward to the one with the occupiers. By the way, Kiasma sometimes looks stunning in the evening sun (summer) if you have your back to the Kamppi shopping centre (which is the best posture to take in that spot). I’m very disappointed by the way the area is being developed – they seem to be just dropping glass buildings here and there with no overall vision. It’s really a shame considering that it’s at the heart of Helsinki. – sigh – I miss the old brick hangars, so run-down but full of life. They should have been left standing and incorporated into something multi-functional. I agree that the Kiasma building has many impressive qualities, it’s just in the wrong place; It would need much more space and trees around it, maybe a bit of sea to reflect it… In fact it should be where the Opera now is. In that it’s the complete opposite of the Opera house, which is very functional on the inside but from the outside looks like a water purification plant. Haven’t made up my mind yet about the Musiikkitalo’s functionality, but from the outside it looks like a corporate office. Or if you look at it from the Aurora Karamzin house side, like the backside of a supermarket. All that’s missing is a big neon logo.